I want to wish you the very happiest Mother’s Day ever. Except you’re not here to celebrate with us any more. And each Mother’s Day I continue to miss you and wish so very much you were still here. Even if it were just for this one special day. Because this would have been the year you’d celebrate Mother’s Day as a great-grandmother. Not that you weren’t a GREAT grandmother to Ashley, because you were the best! But this year you’d actually have that title. Great-grandmother. That beautiful little baby in the photo above…that’s your great-granddaughter in her first few hours of life. The little girl named after you. Almost a year ago. She made you a great-grandmother. And I know you’d wear that title proudly. You wouldn’t mind a bit if anyone knew your age then, because you’d wear it as a badge of honor. Because that granddaughter you’d waited so long for had given you her daughter to bestow that title on you. So many, many times I’ve wished you could see your namesake. Baby Rachel is beautiful. A wonderful, happy, smiling little girl. 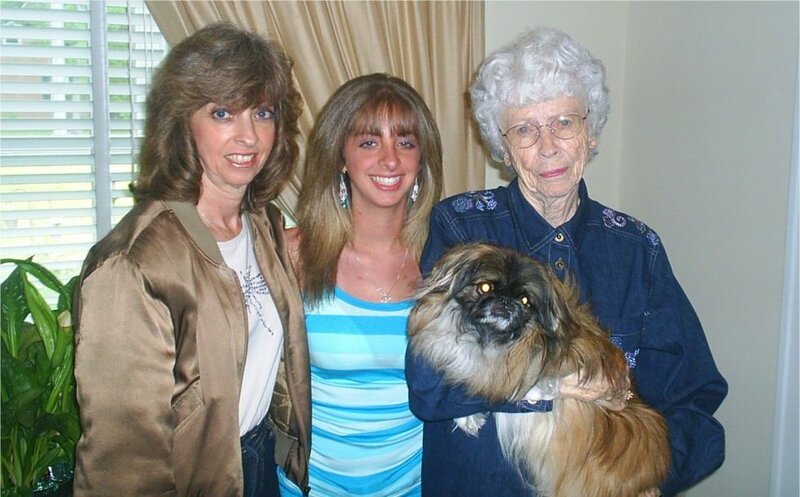 We’d be four generations of strong and loving women….that would have been so wonderful. So many times I’ve wanted to be able to call and tell you about our granddaughter, about that funny little thing she just did, or how especially cute she was that day, or how much fun all of us had taking her shopping, like you used to do with her mother. But there are no phones in heaven. No mail delivery. No photo albums. No Skype. I can’t reach you except in my mind and in my dreams. So many times I’ve wished we’d had smartphones when Ashley was a baby so we could’ve sent you daily pictures and videos of her like we get every day of Rachel. So many times I’ve looked at our granddaughter and seen a glimpse of your smile, your look, and suddenly felt like a part of you was still with us, laughing with us, and just loving that precious baby. But I’m hoping that somehow you know. I’m hoping somehow you’ve seen her, seen your beloved granddaughter with her own beautiful daughter. I’m hoping you and Daddy both have had that privilege to be able to share in all our happiness. I remember so many years ago my Aunt Ruth telling us she believed the Lord let those in heaven see the happy family occasions that were happening with their loved ones back here on earth. Because heaven is a place of total joy, and seeing their loved ones rejoicing over special occasions would only make them happier. Somehow, in some way, I still believe that to this day. So Mom, I’m wishing you a very special Happy Mother’s Day this year. Yes, I still miss you more than words can express. I still cry on occasion because you’re not here. I still talk to you in my mind, and I hope you can hear me. And I can still hear your voice in my head saying my name. And when our granddaughter is old enough to understand, I’m going to tell her all about you. All about the things you used to do with her mother. And I’m hopefully going to get to do those same things with Rachel. Not that my cooking skills will be anything like yours, nor will I ever be able to play “school” like you did, but I’m going to try. You were a one-of-a-kind grandmother. Just like you were a one-of-a-kind mother. And I still will cherish this picture of our three generations on our last Mother’s Day with all three of us. Happy Mother’s Day, Mom. Grandmom. And Great-Grandmom. I’ll love you always.